Mexican drug lord Héctor Beltrán Leyva has died of a heart attack in a hospital to which he was transferred from jail, government officials said. 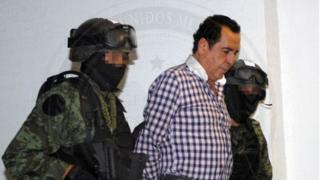 Beltrán Leyva, 56, was one of four brothers who led the drug cartel of the same name which was known for its deadly rivalry with the Sinaloa cartel led by Joaquín "El Chapo" Guzmán. Héctor Beltrán Leyva, the last of the brothers to head the cartel, was arrested in October 2014. He had been posing as an art dealer. Prison officials said they transferred Beltrán Leyva from his cell at a maximum security jail to a hospital in the nearby city of Toluca as soon as they noticed he was suffering from chest pains. He was facing charges of trafficking marijuana, heroin, cocaine and methamphetamines. He took over the leadership of the Beltrán Leyva cartel after his brother Arturo was killed in a shootout with Mexican police in 2009. Two other brothers, Alfredo and Carlos, are in jail. The Beltrán Leyva brothers built up a powerful crime syndicate in the northern state of Sinaloa which later expanded into large parts of Mexico. Their cartel controlled many of the drug smuggling routes from Mexico into the United States. But they also expanded into extortion, racketeering and human trafficking. They built up a sophisticated intelligence network by infiltrating high levels of the security forces and even the government. Their cartel was engaged in a bloody turf war with the Sinaloa cartel and its leader, Joaquín "El Chapo" Guzmán. The brothers had once been allies with Guzmán and reportedly introduced the arguably most famous drug lord into the world of cocaine trafficking. But Guzmán and the Beltrán Leyva brothers split in 2008 and their battle for control of the state's drug routes escalated with the Beltrán Leyva seeking alliances with other cartels to defeat "El Chapo". Guzmán is currently on trial in New York under tight security as he escaped twice from high security jails in Mexico.